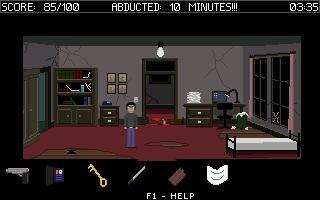 Adventure Game Studio | Games | Abducted: 10 Minutes!!! You play Detective Michael Ebb, from the City Police. Back in 1974, while working for the International Police, you sent a bunch of terrorists to jail. One day, watching the news at home, the bulletin is interrupted with an important message for you: the terrorists are back to haunt you!!! They've got your 20 year old daugther and threaten to kill her in ten minutes. As there's no time to assemble a rescue squad, you head over to the place where the terrorists were last seen in a desperate rescue attempt. Very difficult game, but brilliant design with all of the different choices and outcomes. The game itself is very cool... now with the technical issues. My problem is with the ridiculous hotspots trying to walk into two different doors... after you leave the elevator shaft it is extremely hard to re-enter the upper floor and more importantly, after you shoot the 2nd terrorist, if you don't enter the hostage room immediately, it is also very hard to enter. I had to cheapen my experience and resort to a walkthrough to figure out what to do next, because after 10 minutes I found it impossible to do the obvious (entering the next room). A brilliant game, although the curser positions were a bit too critical which was sometimes frustrating, otherwise a very well thought out game at this level. i like it. very good job, this game is short and sweet. Liked it. Very reduced. No long dialogs or things that aren't necessary. A fast game full of action.